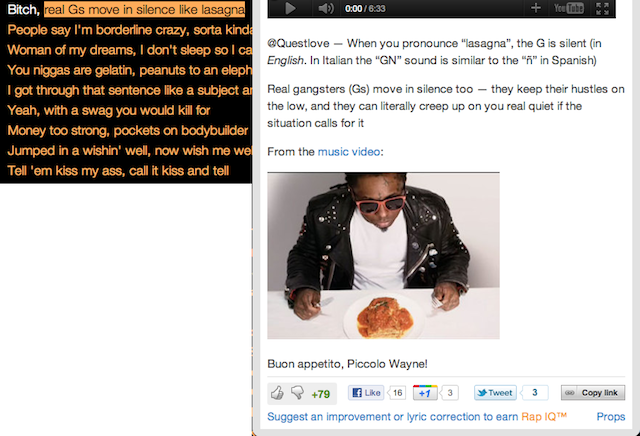 If rap lyrics like “Real G’s move in silence like lasagna” stump you, check out Rap Genius. The crowdsourced hip-hop lyrics explanation site will inform you that Lil Wayne is describing how skilled gangsters can assassinate someone without making a sound, like the letter ‘g’ in ‘lasagna’. But the three-man team behind Rap Genius aren’t satisfied with their current vertical. Today they told me they’re preparing to launch a site for rock music lyrics called Stereo IQ, and one day hope to expand to sites for country music, poetry, legal documents, and religious texts. While presently focused on user growth, the network of sites could monetize through sponsorships of brands mentioned in or related to the explained texts. Rap Genius Co-Founder Mahbod Moghadam tells me “Google wants to index all of text. But what’s more interesting is to try to explain all of text, anything that lends itself to line-by-line analysis.” While a lofty ambition, the bootstrapped startup site is off to a good start, receiving several million unique visitors a month. There’s plenty of runway in the industry, as Mogahadam says 2% of all Google searches are for lyrics. Dozens of lyrics sites now exist, but most are plagued with inaccuracies and awful user experiences cluttered with intrusive ads. This includes frontrunner MetroLyrics, which as of a few years ago had 13.5 million uniques a month and $10 million a year in revenue. Soon people started adding explanations to all sorts of text, not just rap lyrics. The site now features the Bill of Rights, excerpts from the Bible, rock songs, and poetry by Emily Dickinson. Currently, all this is hosted on Rap Genius but Mogahadam wants to launch standalone sites where tight knit communities can gather around specific content. When asked about Quora, which sometimes receives questions on lyric meanings, Mogahadam says “Mad respect for the guys who started it, but I think it’s too big — trying to do all of knowledge in one site. If you look at answers in areas other than technology, they’re not as good.” He says he’s willing to forgo the SEO benefits of a single site in favor of creating destinations that enthusiasts of particular verticals will keep coming back to for the latest explanations. For monetization, Rap Genius currently offers branded merchandise that doubles as promotion, and is reluctant to sell ads. I told the company I think it’s best bet is to get brands that are name-dropped in their lyrics or explanations to buy for sponsorships or site take-overs. If you just found out your favorite rapper is talking about Ciroc vodka or Audi automobiles in his songs, you might be highly susceptible to marketing from those brands.